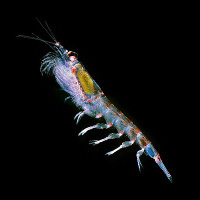 Krill, a type of zooplankton, is not eaten but instead most commonly used as fishing bait. It is often confused with Akiami paste shrimp. Despite the similar appearance, akiami is a type of shrimp not to be confused with krill. Okiami krill is a good source of calcium and vitamins such vitamin B12. The degree of freshness is easily described by the odor it gives off. When using in cooking, attaining fresh krill is recommended. In cooking krill is often seen added to Kakiage shrimp and vegetable fritters and Chinese-style fried rice recipes. The calories in Krill per 20g(1tbsp) is 19 calories. Krill is calculated to be 94Cal per 100 grams making 80Cal equivalent to 85.11g with 3g of mostly protein、0.64g of fat、0.04g of carbohydrates in 20g while being rich in vitamins and minerals such as Copper and Vitamin B12.